Kilmore Cottages provide memorable holidays for our guests in four star holiday homes, in Co Wexford, South East Ireland. Kilmore Cottages provide memorable holidays for our guests in four star holiday homes, in Co Wexford, South East Ireland. The self catering accommodation is situated on our organic working farm, in a peaceful rural location, with many beaches nearby. Our holiday properties are owner managed, and we greet all our guests personally. From farm fresh eggs and a welcome tray on arrival to the provision of all modern conveniences, including free WiFi access, we aim to make your stay comfortable and relaxing. Avail of our guided farm tour or visit the pretty fishing village of Kilmore Quay. We live adjacent to the holiday cottages and are on hand if you have any queries during your stay. We are happy to help guests to find activities and attractions that suit your particular needs and interests, so please contact us if there is anything special that you are interested in. Each cottage has a local information pack with brochures and maps. We are proud to have been awarded an ABLE Business Excellence Award for customer service, and are committed to the provision of a great holiday experience for all our guests. We are pleased to have facilities to welcome guests with disability and have experience in providing practical advice for holidays for the disabled. We look forward to welcoming you to Kilmore Cottage soon! 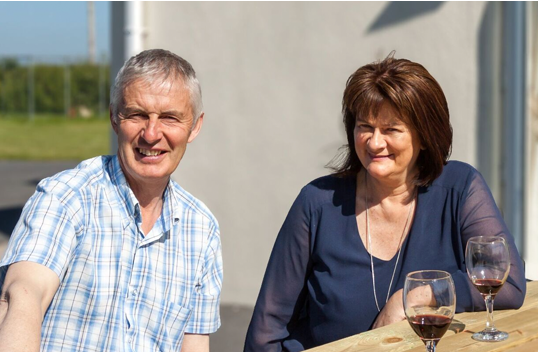 You can enjoy a relaxing Irish farm holiday at your own pace and on your own terms with Kilmore Cottage holiday homes, located on our organic working farm.We are pleased to be able to offer all our guests a guided tour of the farm, which can be arranged during your stay. The farm is engaged in animal husbandry. You can see the cows as they graze and rear their calves and everyone loves the donkeys! There are two hens in an enclosed run in the garden to provide you with farm fresh eggs every day. The herds of cows often graze in the paddocks behind the cottages, depending on where the best grasslands are. You can also visit and buy produce from neighbouring farms. If you have any queries please contact us or visit our Frequently Asked Questions section (FAQ). We look forward to welcoming you to Kilmore Cottage soon! Molly likes to greet all our guests personally, and she loves children. Molly is a purebred Border Collie and she has lived with us since she was a pup in 2009. She likes to go for walks on the beach and she helps John out on the farm. She also loves attention!